I have been away longer than anticipated. I don't know how other bloggers out there manage to continue to sew in huge numbers with young children, and even new babies (yes, Katie I am thinking of you). I'm exhausted with 4 children full time, a husband who is hardly around yada yada yada. I finally managed to sew some in the last couple of days. Given the wadders, I wanted something easy and gratifying instead of more disappointment. My eldest has begun religious classes and has books she needs to carry to and from her lessons. So I decided to make her a tote bag. Of course, her sister who isn't quite old enough to join her, wants one too. And of course then, eldest daughter's friend, whom she goes to classes with, wants one too. 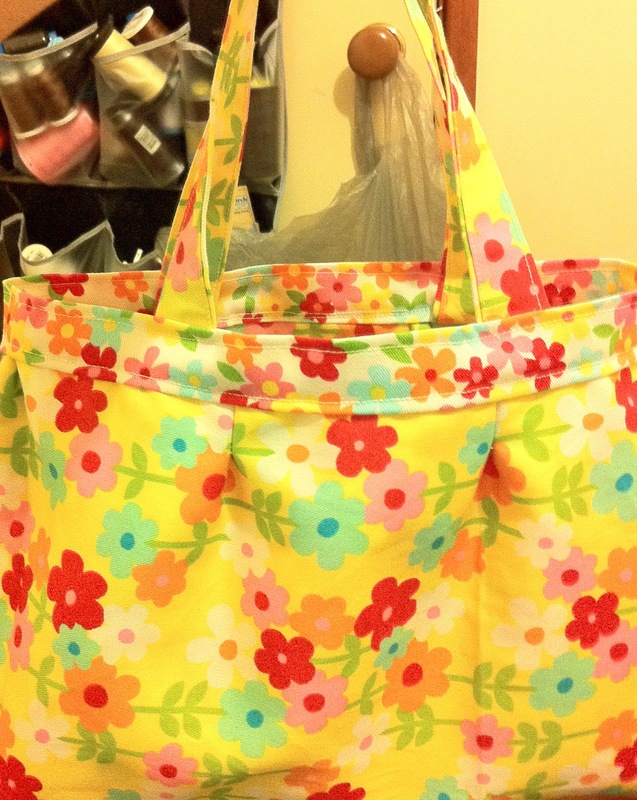 So I began with this tote bag by Betz White's Make New or Make Do patterns, the Isabella tote, only making its mini version, Izzy. Please forgive the flourescent lighting effect, and the crookedness of the band. It is actually pretty even, I'm just holding it up by one finger to take the photo. It was a nice straight forward pattern, lined; with tucks. Clear instructions. The only thing I didn't like was, for that much money for a pattern, I'd expect a pattern template instead of having to draw it myself. The finished size is 11 inches by 9 inches by 3, which is a perfect fit for daughter's books, if a big snug. If I wanted to add an inch all over, is it simple maths to do so, or do I need some more complicated method of calculation, especially since the pattern pieces consist of a lined bag piece, and a band that fits on the main piece, and tucks into the main bag piece? The next size, Isabella, is a finished size of 14" by 11" by 5". Anyway. Onto the second attempt tomorrow I hope, if the children behave. It feels nice to finish something! We do what we can, when we can. Don't sweat on it. Your bag is colourful and well made. Really pretty bag - I would run off with it too if it were mine! nice bag. I'm sure your daughter loves it. I would too!